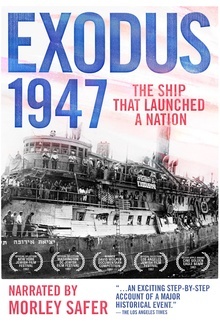 The PBS documentary Exodus 1947 tells the story of the secret American involvement in "illegal" immigration to Palestine after WWII. The program is narrated by Morley Safer. After World War II, a group of private American citizens banded together in a clandestine effort to transport Holocaust survivors to Palestine. EXODUS 1947 is a one hour documentary narrated by Morley Safer with a score by Ilan Rechtman. The film is a richly layered program, constructed with first person accounts to recall events that shaped world history. A British blockade intercepted Exodus 1947 in international waters off the coast of Palestine. The tense standoff culminated in a direct attack by military personnel against the unarmed civilians on the ship. This highly publicized international incident heavily influenced the United Nations resolution authorizing the partitioning of Palestine into separate Arab and Jewish states. Thus, the Exodus 1947 voyage acted as a catalyst in forming the new State of Israel. The documentary film focuses on clandestine and “illegal” American efforts to finance and crew the most infamous of ten American ships that attempted to bring Jewish refugees to Palestine.